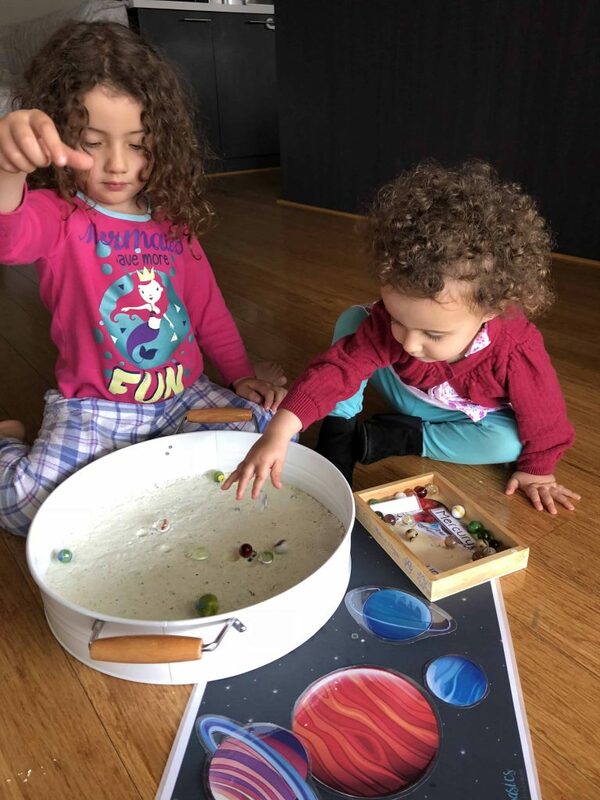 Our Space themed play for the week has been a hit and we are only at day 1. Miss 4 was so proud to share her newly learnt knowledge with her Dad when he got home from work. 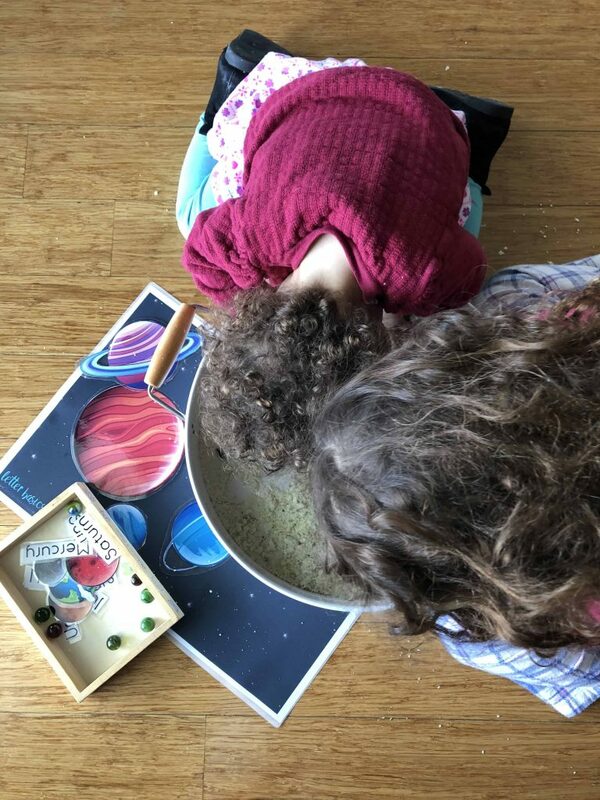 One activity that stood out for her was making Moon Dust. We had already explored the planets, sun and boundaries of the sky however I had neglected our own moon in our outer space discussions. 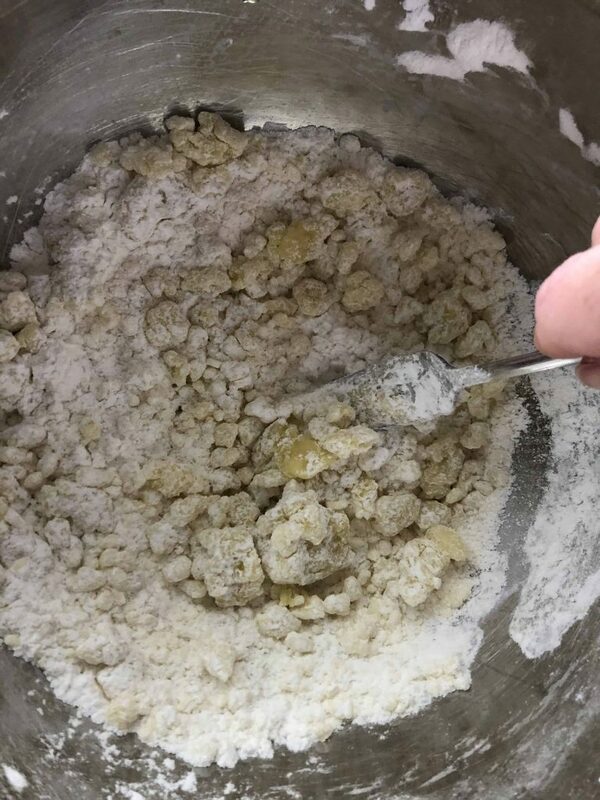 To make our moon dust, we used three ingredients that we happened to have available in the pantry already! Bang- got to love it when that happens! 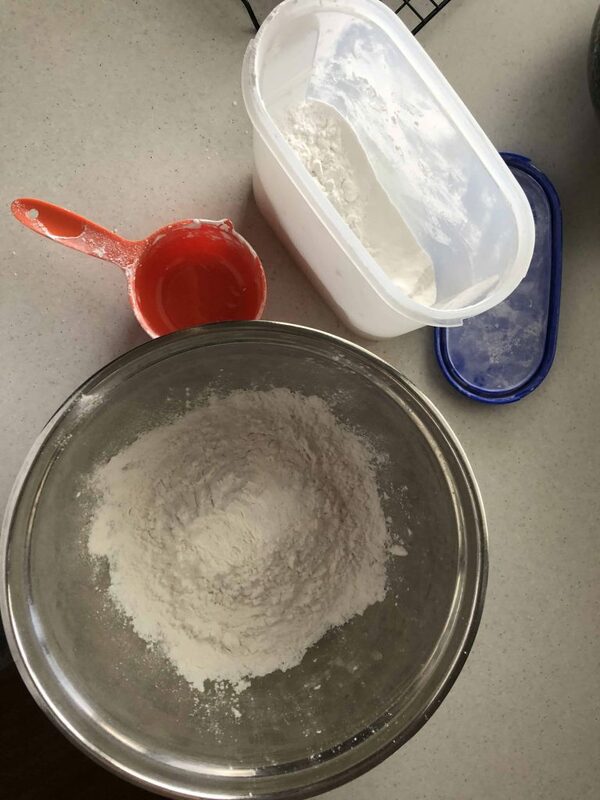 All you need to do is mix the flour and oil in a bowl, drop in your colouring and mix. Yes, it is that easy! 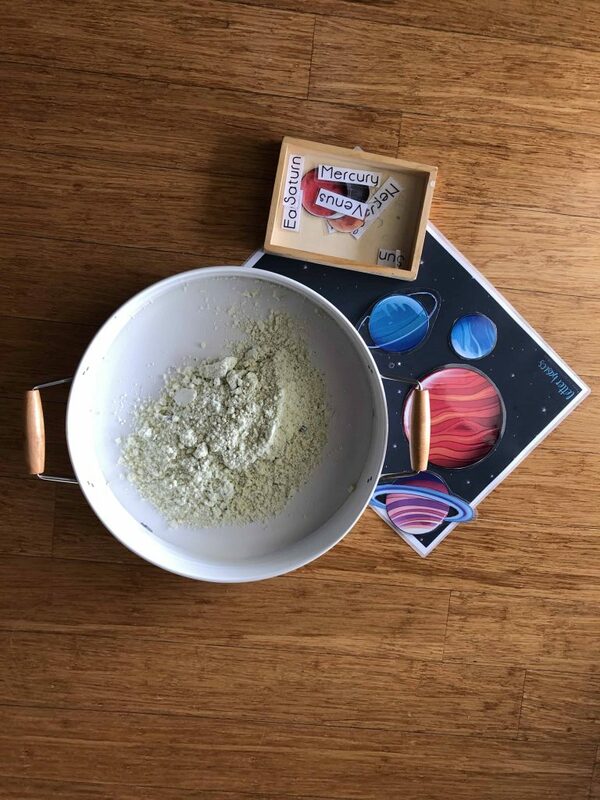 The food colouring doesn’t spread evenly which is perfect for our moon dust. It makes it look that little bit more interesting. 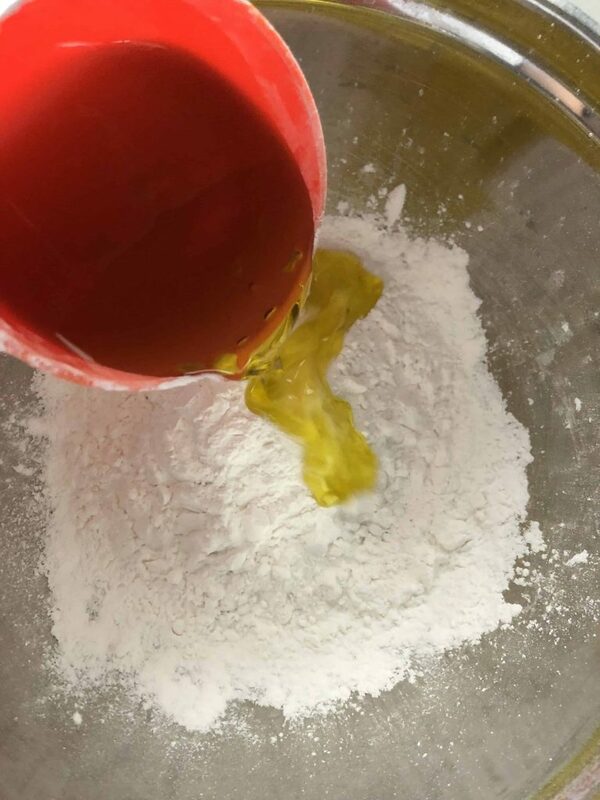 This blend results in the most amazing texture. It squeaks when squeezed like super fine beach sand. It holds its shape under pressure and then crumbles very easily too! 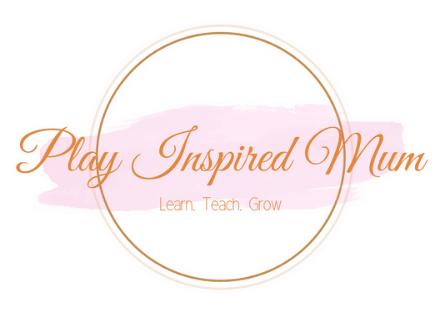 You could probably add a tablespoon of cocoa and call it dirt in a small world set up! 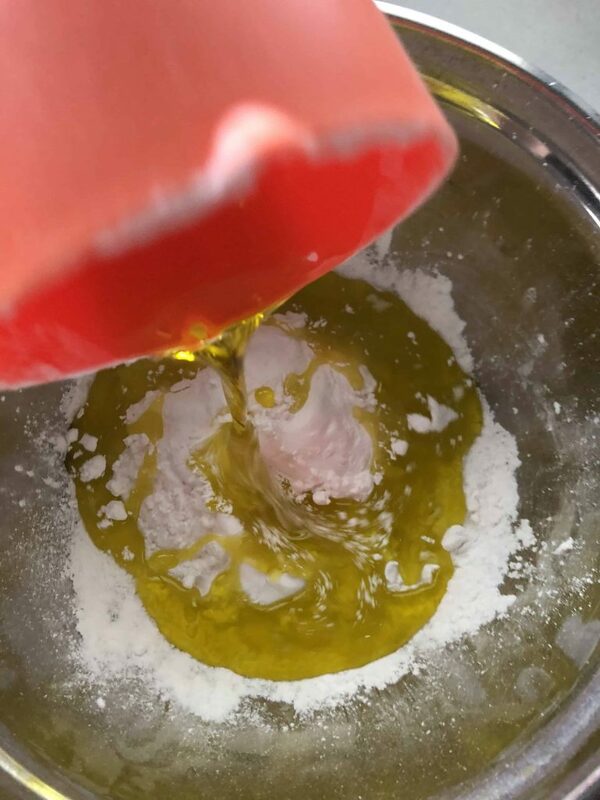 The olive oil gave it a lovely scent. This was an unexpected element that will really add to the experience. 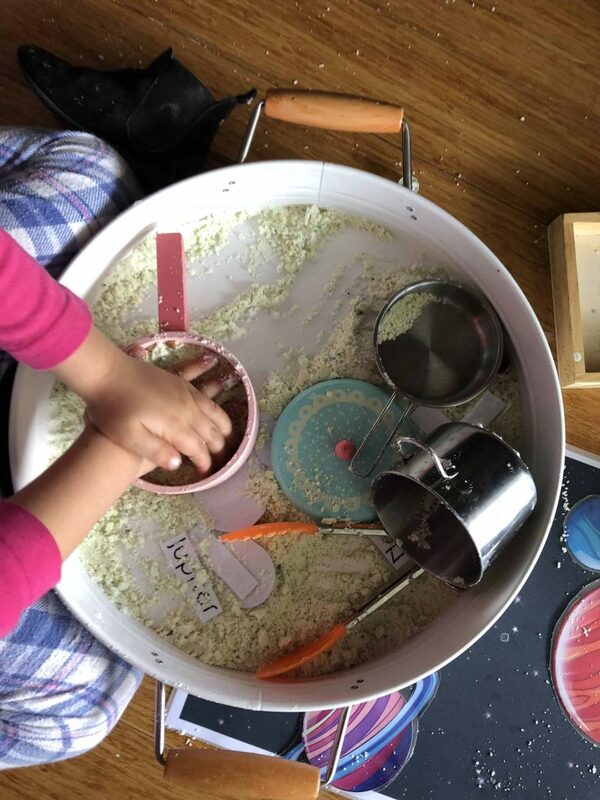 Once it was all mixed together, we set up our play tray. Today’s activity was a simple one. 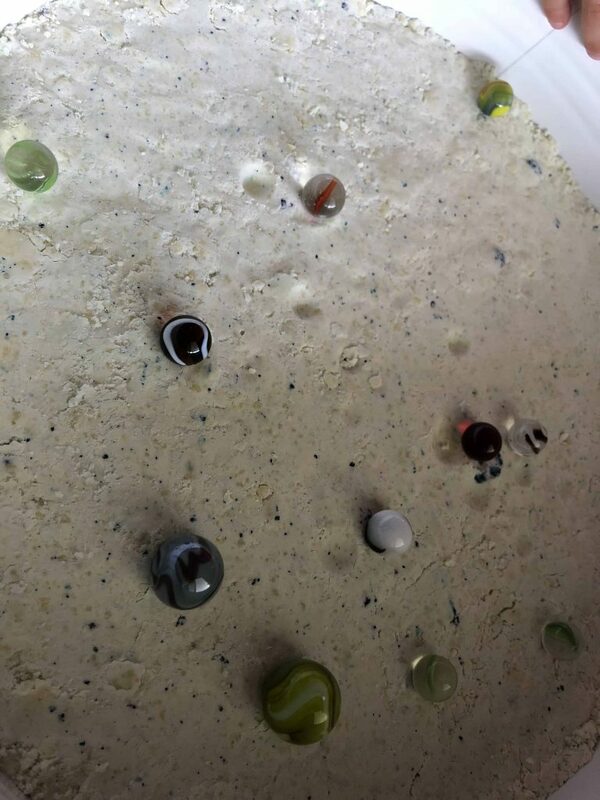 The brief was to drop the asteroids and meteorites (aka marbles) into the moon dust to create craters on the moons surface. 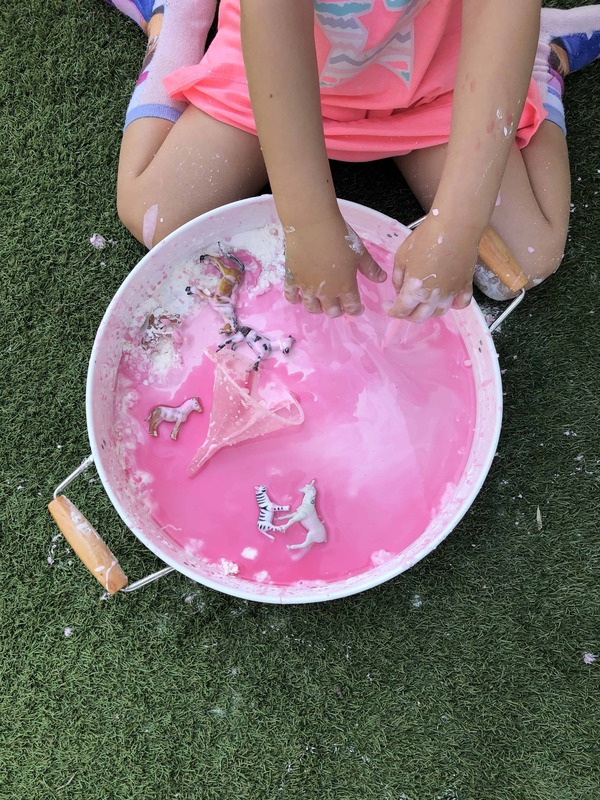 For maximum impact, I smoothed the moon dust over the surface of our play tray. 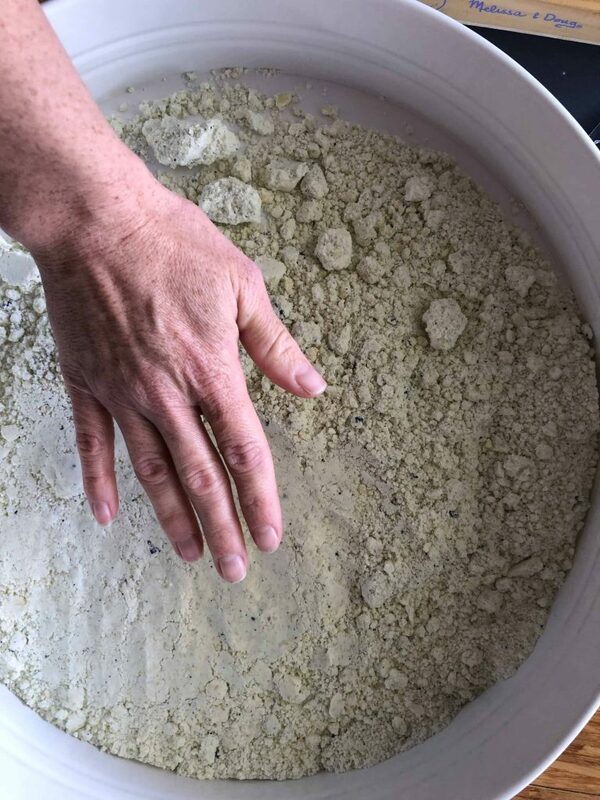 By gently pressing it with my palm, I was able to create a surface which the craters would be obvious. Just quietly, it was a strange sensation and felt really awesome! 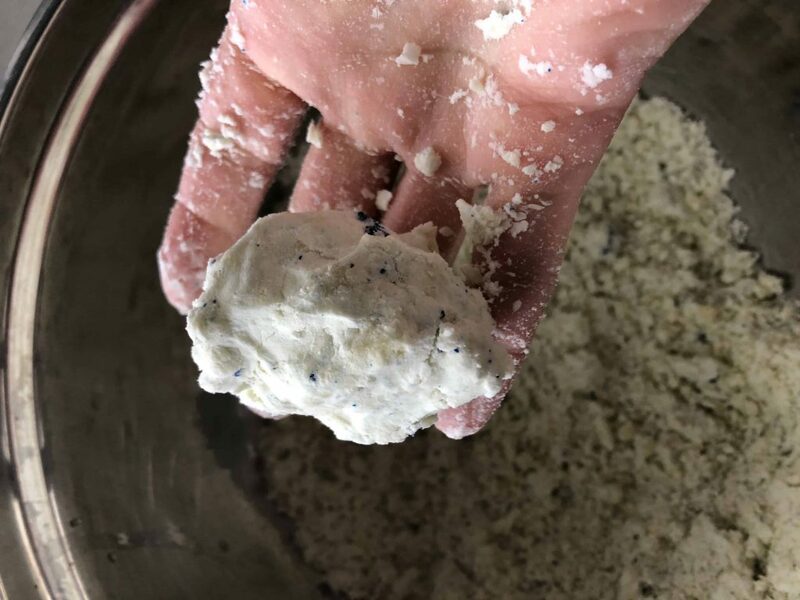 The fine arrowroot flour really does give this blend such an interesting texture! 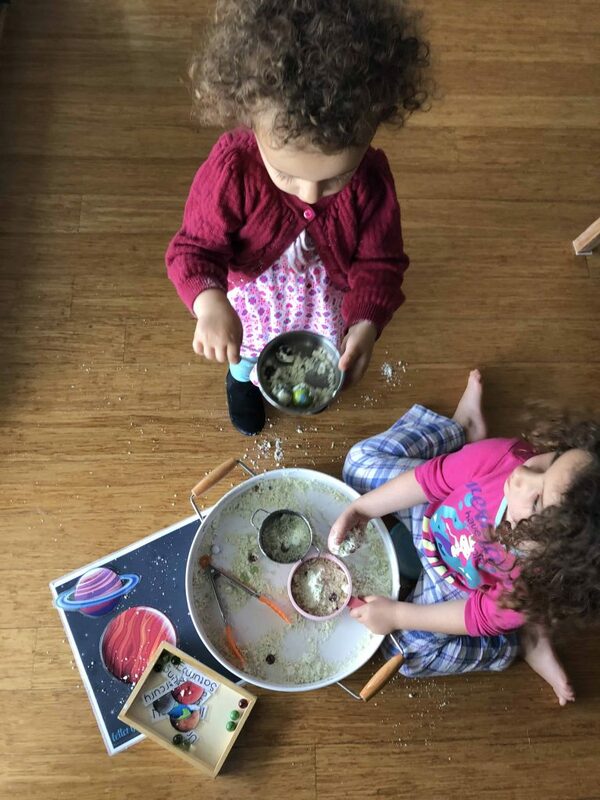 Initially both the girls were confused when I asked them to drop marbles into the tray. 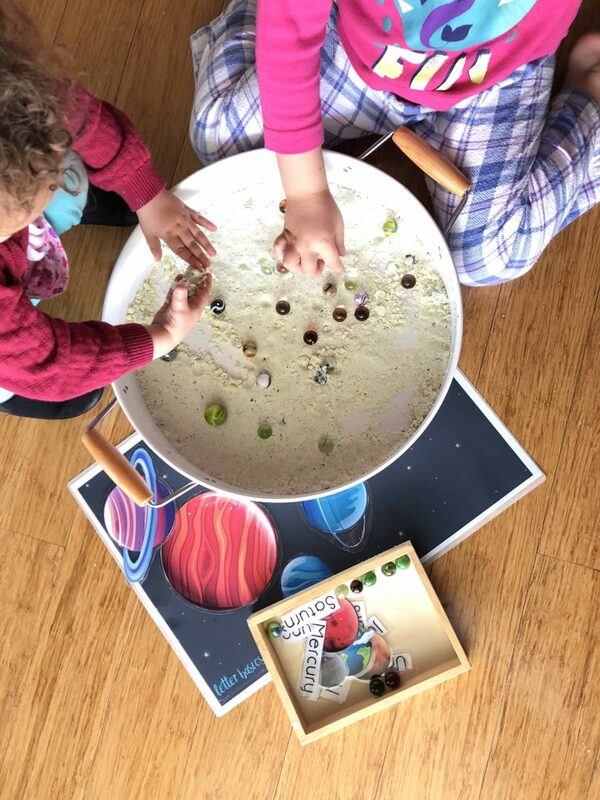 Miss 4 really wanted to pour the marbles into the tray and roll them through the dust – certainly a great idea! 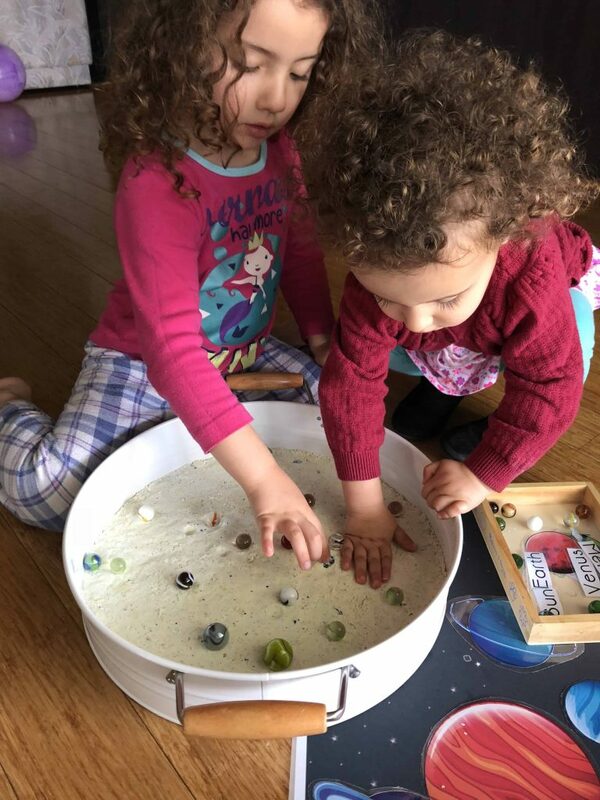 Once I showed them the effect the falling marble had on the moon dust, their busily got to work exploring different heights and different colour marbles (apparently the colour makes a huge difference). In no time at all, our moon dust had as many dimples as an orange! The marbles did their job perfectly! The moon dust absorbed the weight of the marble creating wonderful little divets on the surface of the moon dust. 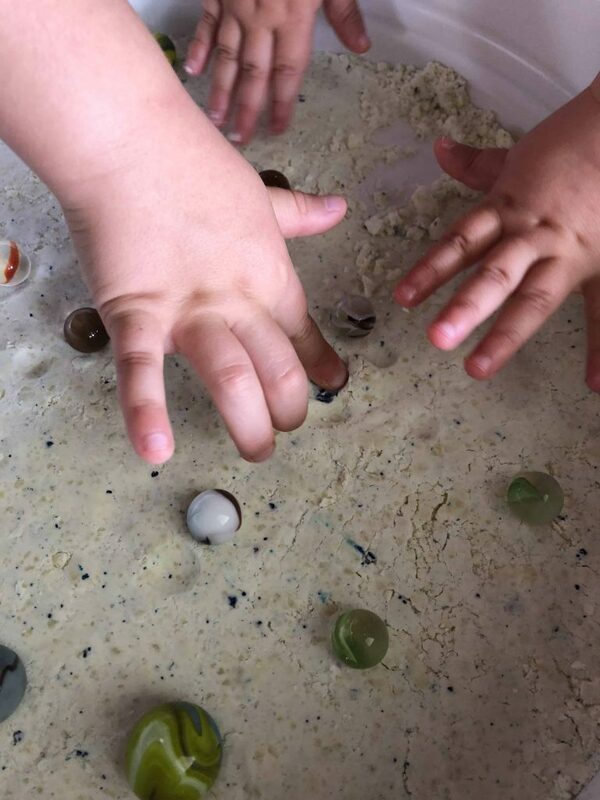 Curious fingers then began to explore their impact in the moon dust. 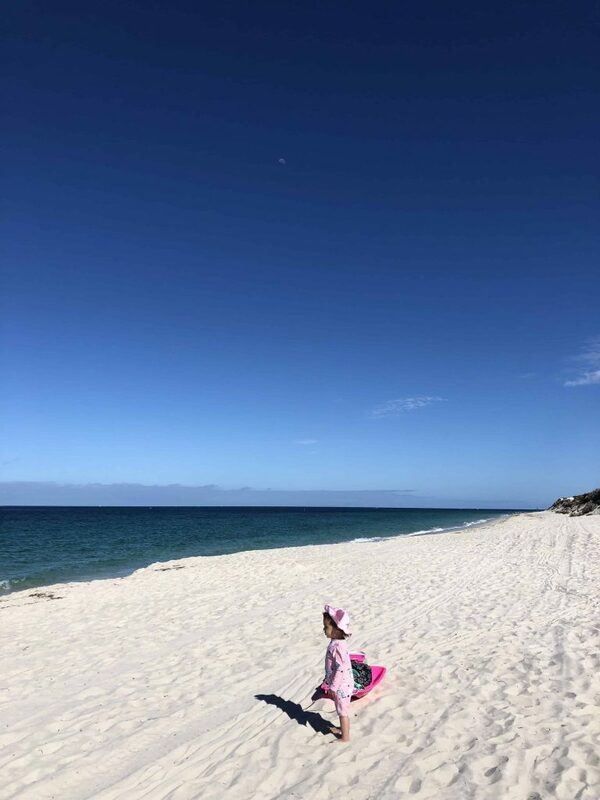 Miss 19m loved digging her fingers into the dust then drag them towards her. 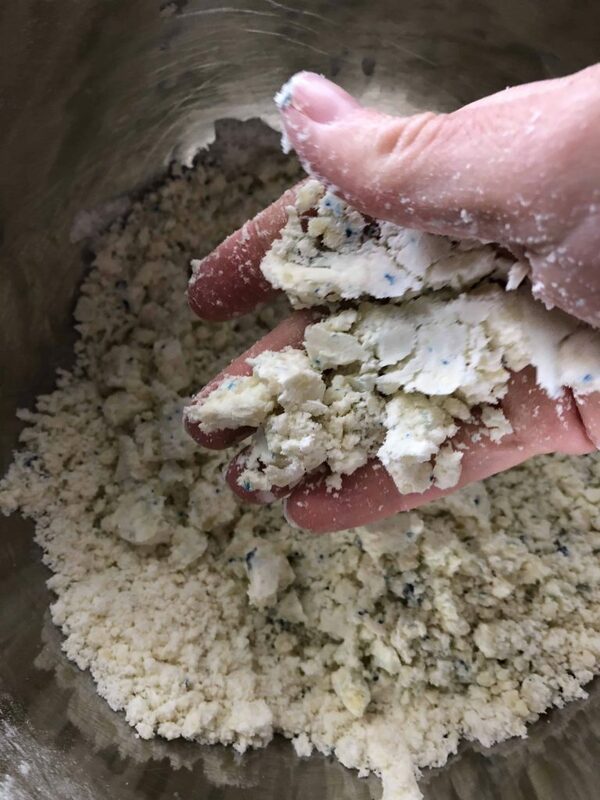 There were four busy hands pressing, scraping, squeezing and crumbling the moon dust. Once the excitement of dropping the marbles into the tray had passed, Miss 4 asked if she could add some equipment from their toy kitchen. With a confidence that comes with a yes, she ran into the play room to retrieve some pots and pans. 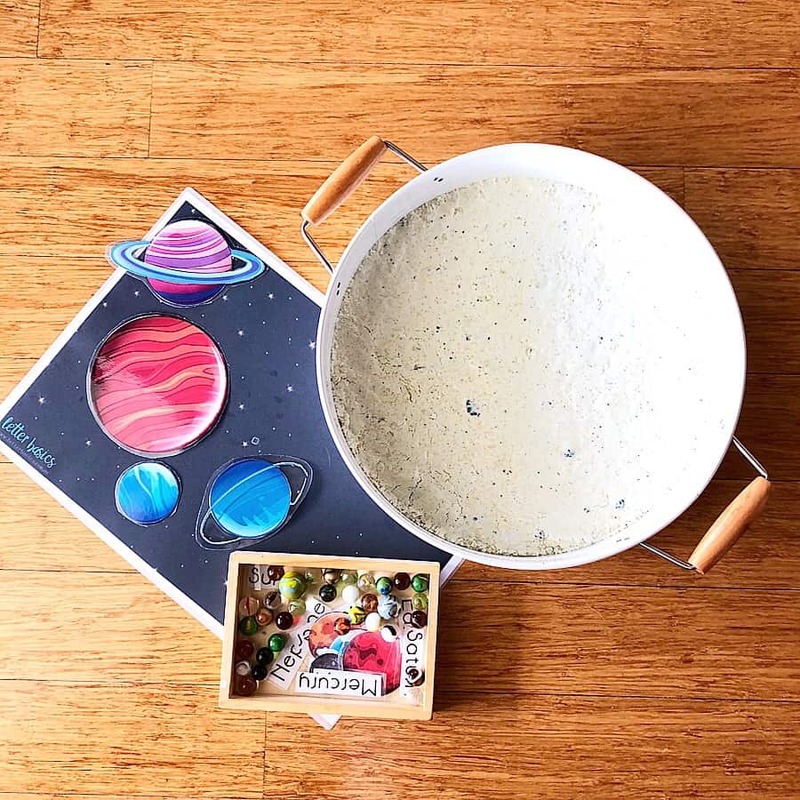 A moon dust bake off was about to begin! 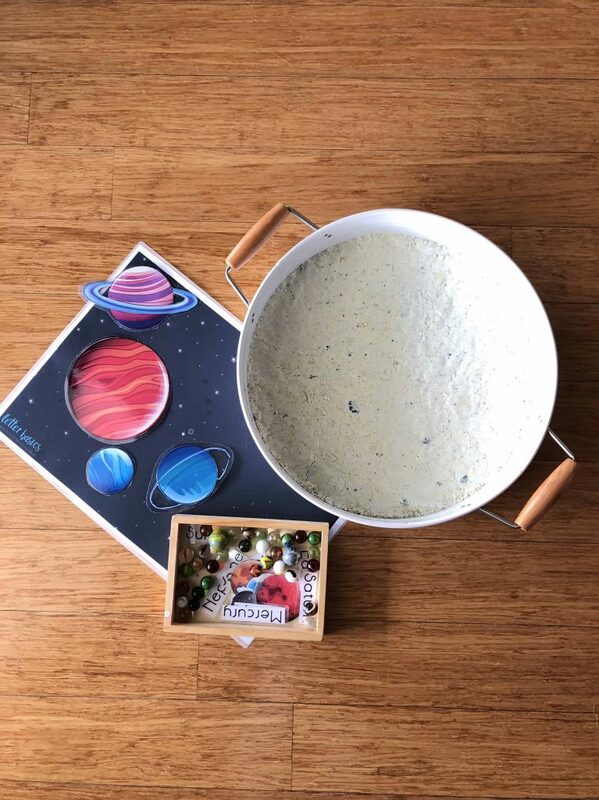 Marble stew, baked marbles and marble pie were all on the menu. 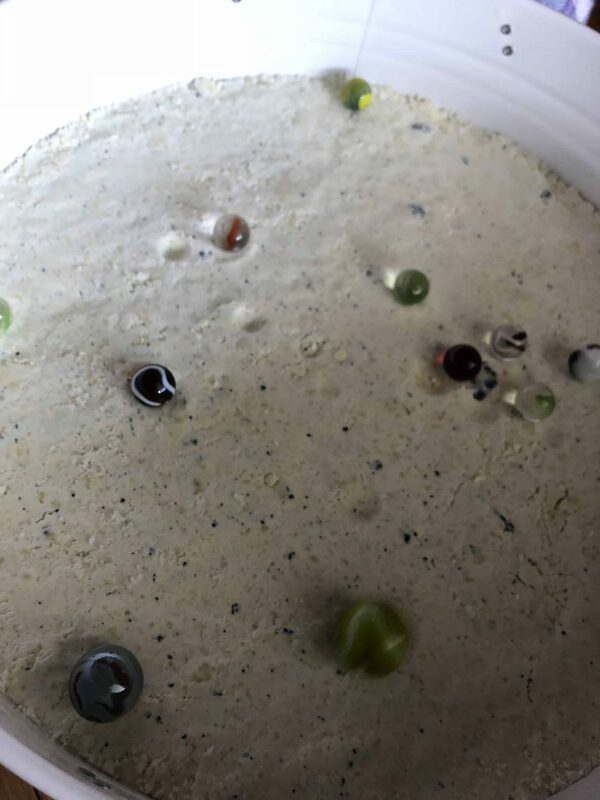 Marbles were dropped into the bottom of the pot and covered with moon dust. 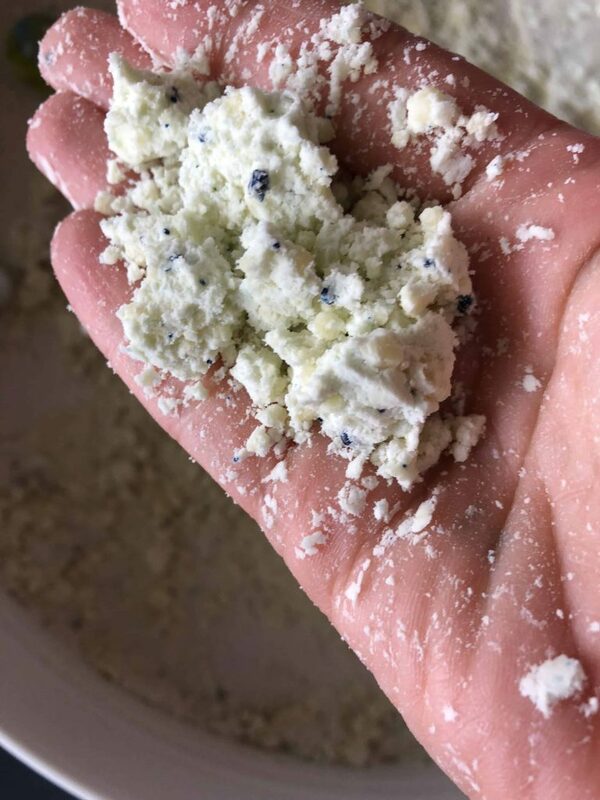 The mixture was pressed until it was compact then busy fingers scratched and scraped until it was loose again. You know that it is a success when those words are said! Even more so when you try and get a photo of what they are doing and this is the best you can get. Our moon exploration was heaps of fun! Miss 4 is so proud of newly discovered knowledge. 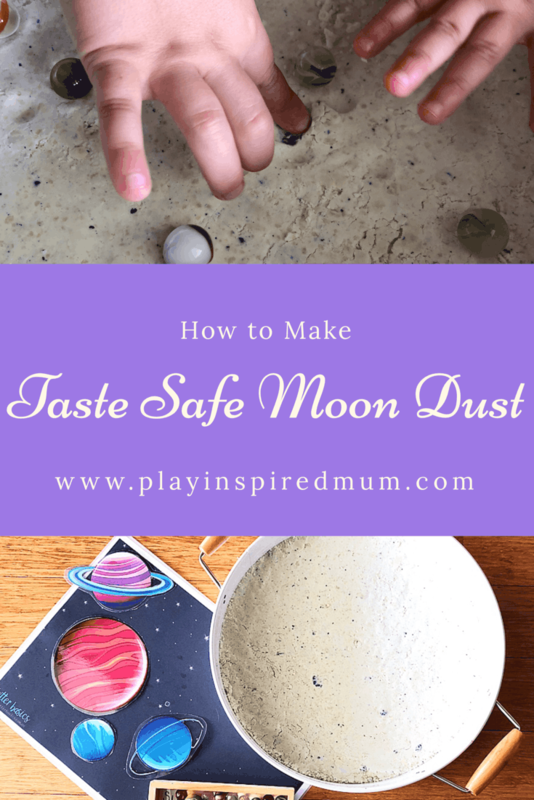 We will definitely revisit the moon and moon dust again! 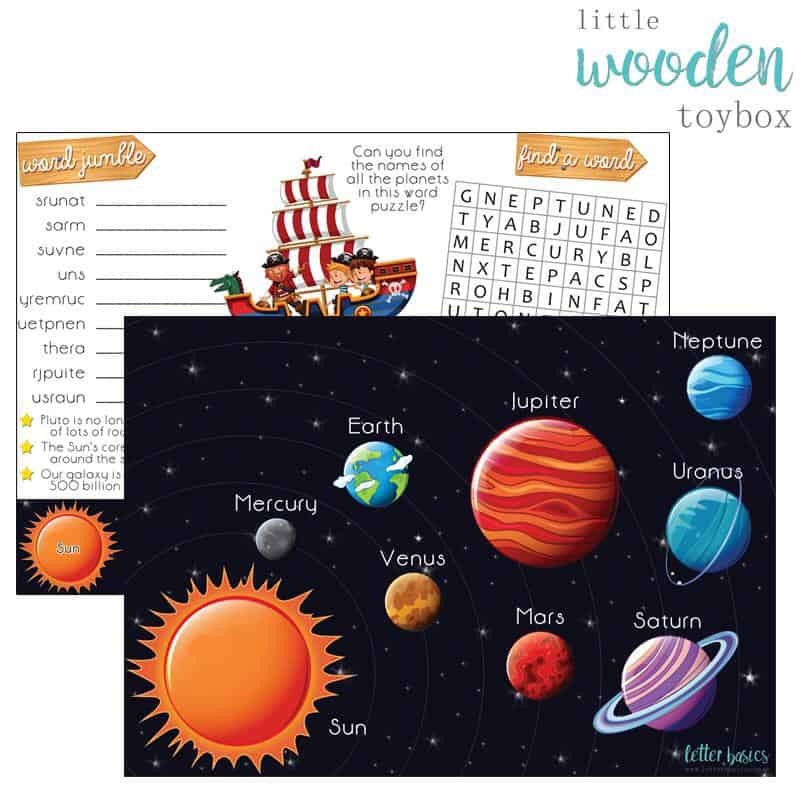 Get your Space themed resources here! 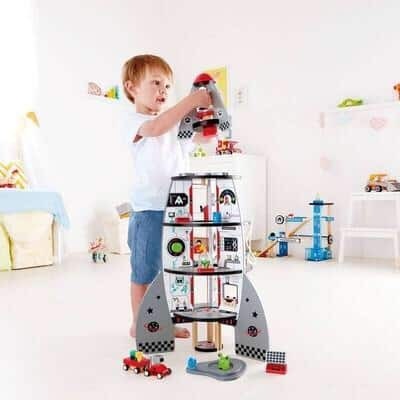 Continue your journey through space with these amazing space themed toys! I LOVE this idea! 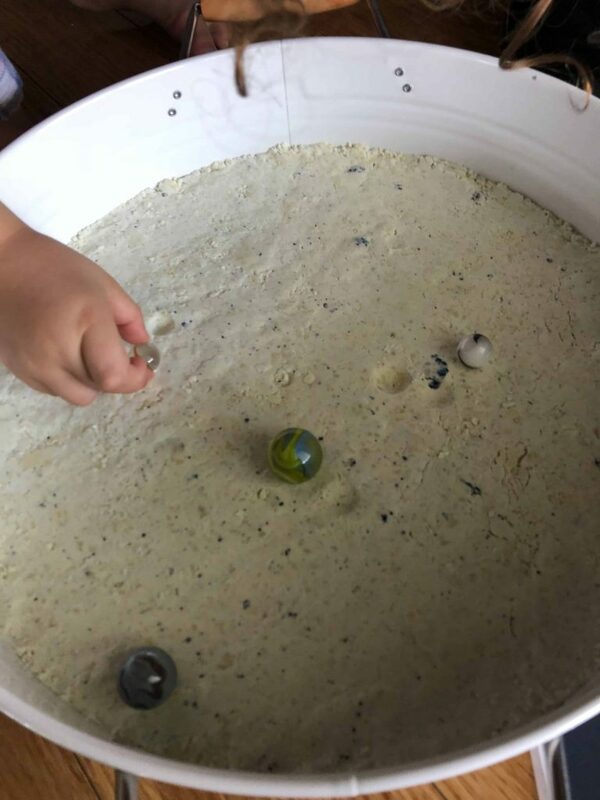 I have made moon sand for my 3 yo, but I really like the idea of using marbles to make craters. Great educational post! Thank you! I’m so glad you love it! 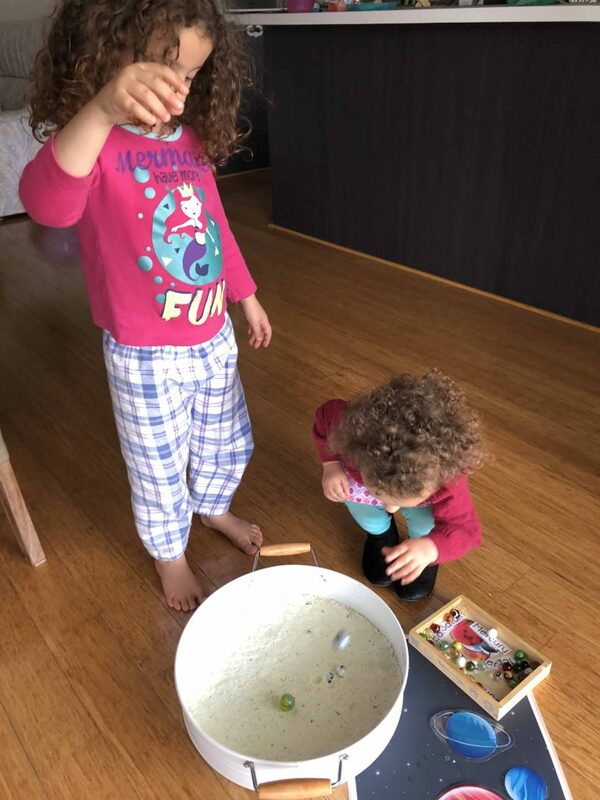 My Miss 4 loves having permission to drop the marbles which she is usually asked to take care with. The element of something new and almost dangerous was exciting! How adorable are they? This makes a great rainy day project after all we always have those ingredients. Thanks for sharing. Nice activity for kids. Looks like it would provide lots of entertainment. 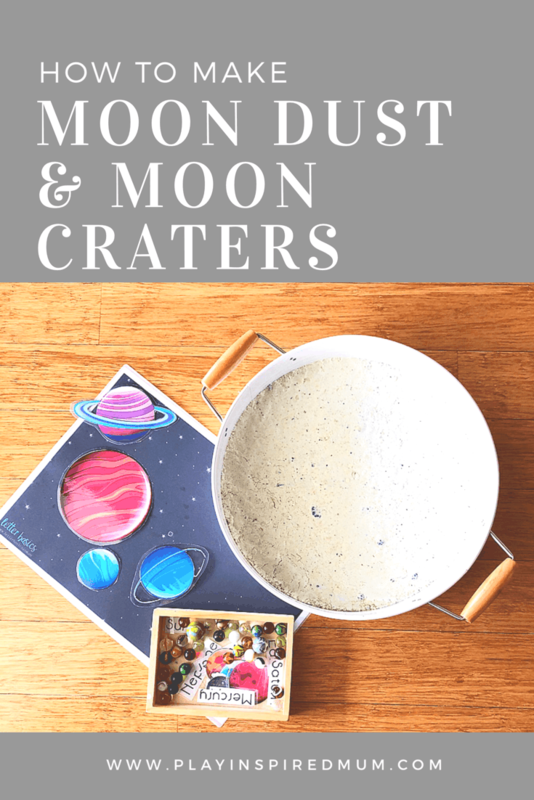 Such a fun craft for the kids! I’m sure it comes in handy during the long winters inside. We’ve done jello with dinosaurs in the sensory box, but now the boys have moved on to the “space theme”. 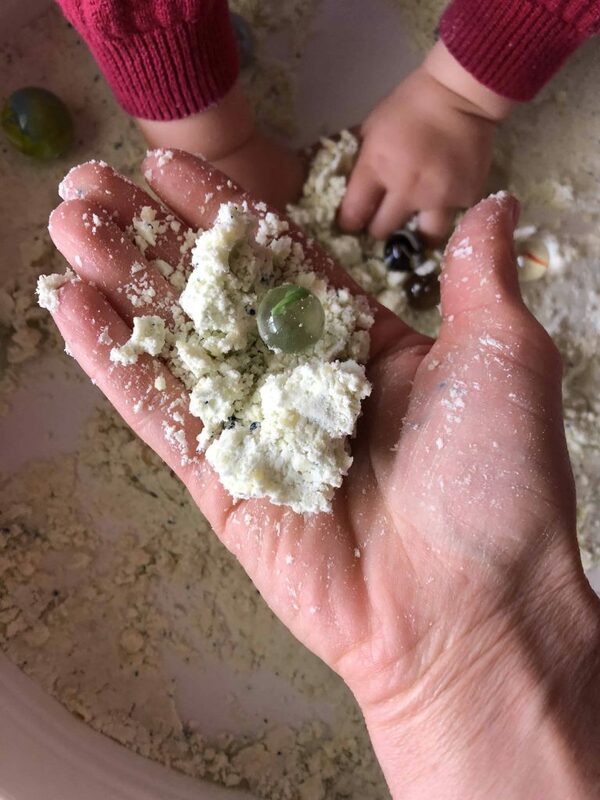 Going to try this out for the next messy play activity (but we will probably do it in the garden #lazymum). I love this idea! This looks like so much fun. 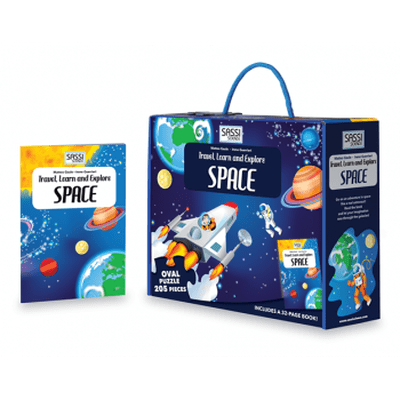 My four year old would definitely love this, especially because he will be starting school in September and really starting to learn more about space! 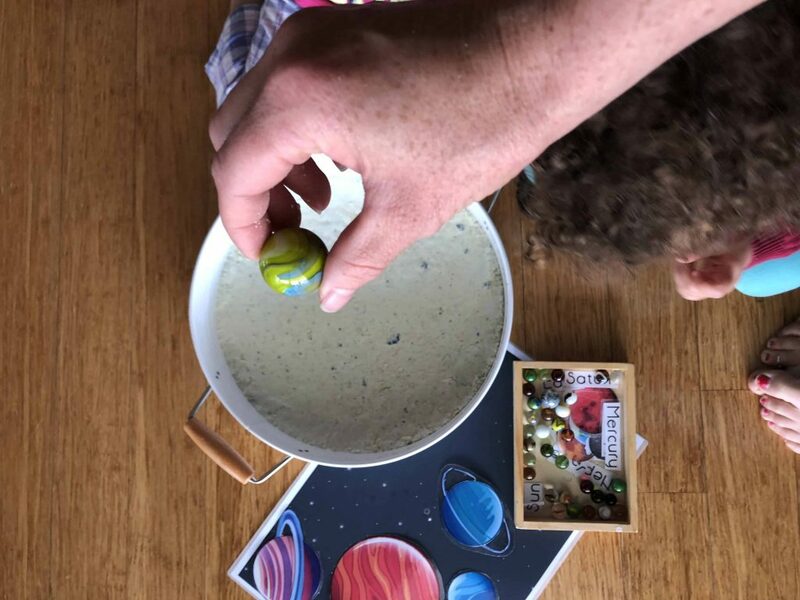 Such a wonderful activity to do with my children. We may have to try this activity this weekend. This looks like a fun activity to do with kids. I will have to keep this in mind for the future. Wow, this looks extremely fun! I wish I knew about this last year as we did a space unit in class. This looks like so much fun to do with kids. 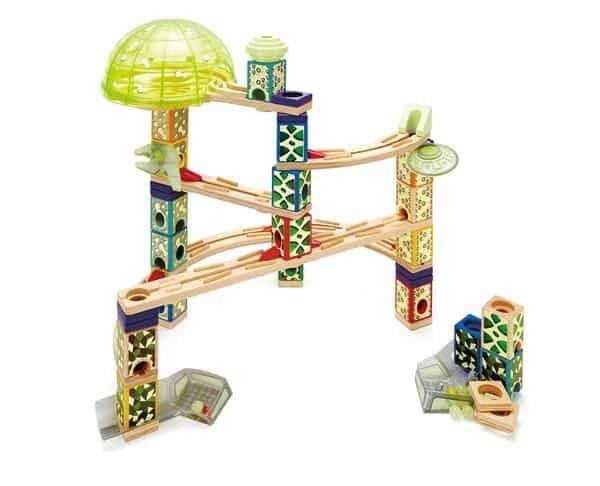 This will help them building creative thinking ability. Thank you so much for sharing. 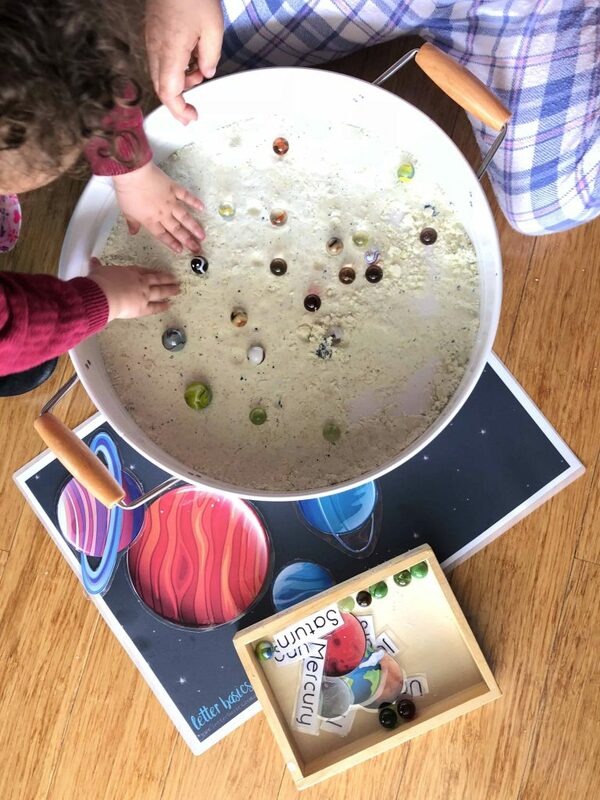 Looks amazing activity for kids. Would definitely love to try with my niece I love such kind of posts. Thanks so much for sharing!! My kids would Love this! 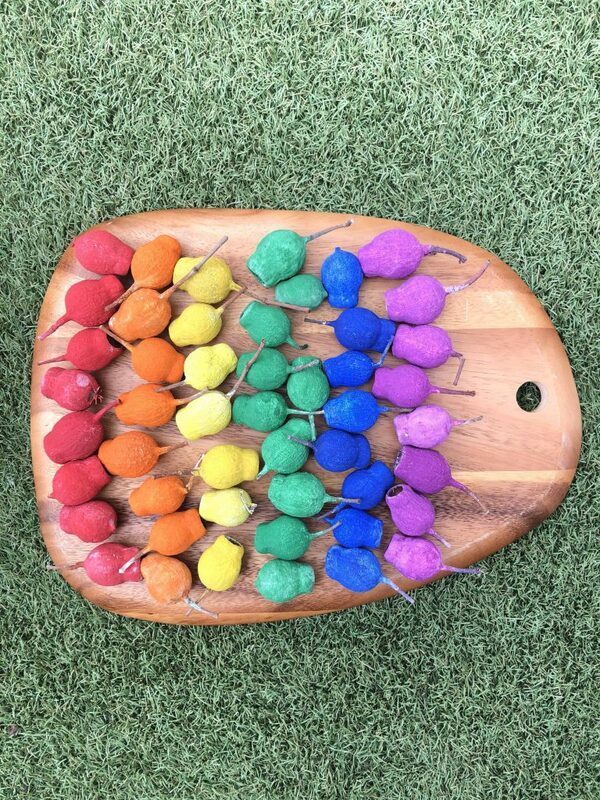 Very creative project for the kiddos and looks like a lot of fun for them too. This totally looks like so much fun! My kids would definitely have a blast with this. Wow such a great art I love this! I’ am sure kids would totally love this!